The miraculous icon of the mother of God, called "vsetsaritsa" was written in the 17th century. It's a small image of the blessed virgin known to healing cancer patients, so it is tirelessly committed pilgrimage of believers who are eager to obtain mercy from "Security". Where is this icon and what else is she known for? Today, the original miracle-working image Bozhiej of Mother is stored on Holy mount Athos. The icon is in the Cathedral Church of the monastery of Vatopedi monastery, to the left of the Royal doors. "Vsetsaritsa" represents the image of the blessed virgin Mary in the scarlet clothes which is sitting on a throne and holds in his hands the infant Jesus. Jesus in his left hand holds a scroll and the right hand blesses the people with icons. The virgin's right hand points to the Savior, and behind her stand two angels with outstretched wings. But "Security", on the site of the monastery of Vatopedi is also another relic - the Belt of the virgin. This icon is iconographic – that is, the all-immaculate and all-merciful. Such epithets usually accompany such depictions of the virgin Mary, and their common feature is the sitting Mary on a throne, which symbolizes her glory and Royal Majesty. The icon shows his miraculous power by healing people suffering from cancer. Healed her first "patient" was the man who lived in the 17th century – since then hot prayerful appeal to the "seven arrows" has saved many a seemingly doomed men. In 1995, the wonderworking icon was brought to Russia and placed in the children's oncological centre on Kashirsky highway at the request of the Community of charity of St. John of Kronstadt. With the Athonite icon, with the blessing of vicar of the monastery of Vatopedi, Archimandrite Ephraim, has been made an exact copy. It was written with observance of prayer predstoyanie, Canon and solemn religious services, after which "vsetsaritsa", brought to the center, beginning to help sick children. As the children quickly began to improve, and the improvement could not be explained with a single medication and radiation. Christmas icon suddenly began to stream myrrh, filling the air with unearthly fragrance. 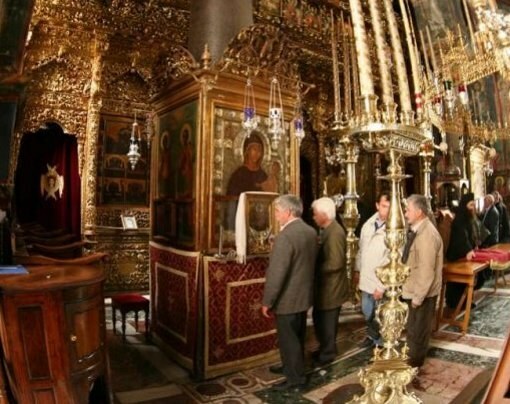 She was placed in the temple of the blessed virgin where she zamirotochila again, and then there was yet another miracle "vsetsaritsa" healed a guy who was a drug addict for many years. After that, it began to contact parents of children who are addicted to pernicious habits. Today the icon is at the former Novo-Alekseyevsky monastery in the Church of All Saints (Krasnoselsky pereulok). Periodically the image is brought to the cancer center, where in front of him are the prayers.